I enjoy writing about the Thanksgiving season at Assets. The focus on community and gratitude is heartwarming. Of course, our goal is to find ways to extend and make these efforts part of our typical school day, across the whole year. For example, if you attend one of our weekly assemblies, you’ll hear students publicly read notes of thanks from our Good Vibrations Station. These messages recognize good friends, kind deeds, supportive teachers, excellent colleagues and many others who make our school such a wonderful place. This is a tradition that students started three years ago and one we’ve held dear since. I am thankful for this since we know that gratitude not only has wide-ranging personal benefits but it can be cultivated through practice. 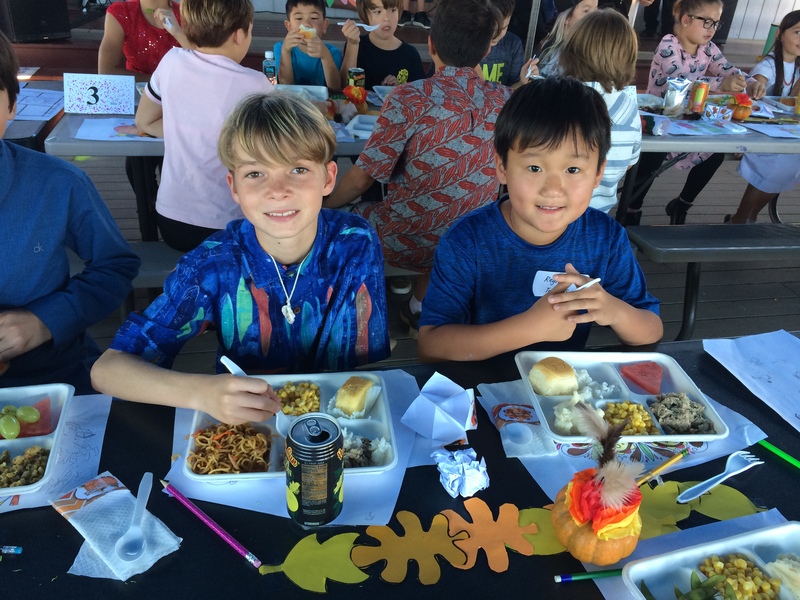 This year, we started a new tradition by hosting our first K-8 Thanksgiving celebration! Mahalo to Mr. Gabe and the Student Senate for agreeing to plan and coordinate this event. Through the help of many hands, over 220 students and faculty members sat and shared a meal together. We now have a much better appreciation for wedding planners and caterers! As we were imagining this celebration, there were a couple ideas that we felt were crucial. Number one was that all homerooms should play some role in either the preparation or execution of the event. The students should have roles and jobs to fill; as opposed to simply sitting down to a meal that the adults have prepared for them. What an inspiring success this was. Students moved tables and set the arrangement. They created and hung decorations. They organized a food drive. Students made placemats, table runners, centerpieces, vases and table placards. Students rolled silverware and served food. 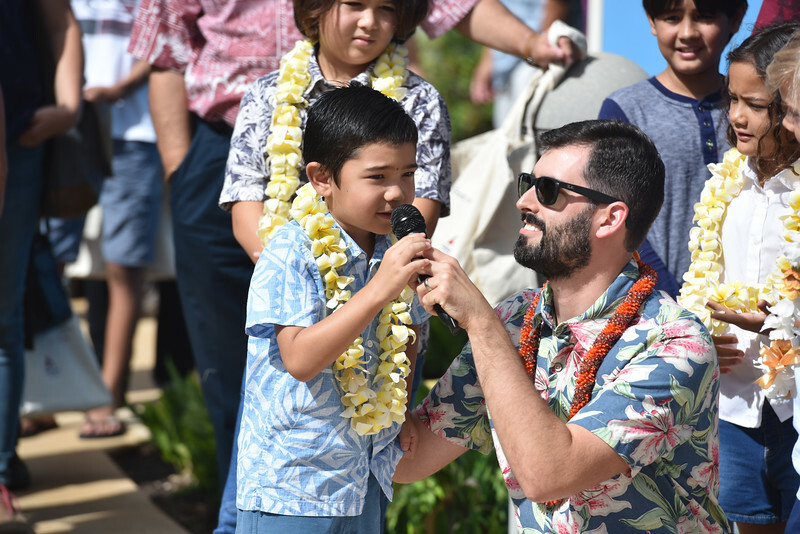 As with assembly, a middle school student served as MC for the event and students kicked off the celebration with songs. Ms. Peggy led us in a mindful moment before we ate. When the event was over, students helped clean tables, and move tables and chairs. The other idea we felt strongly about was that the seating should be mixed-ages. We had 8th graders sitting next to kindergartners and 1st graders next to 5th graders, who were sitting alongside teachers. Why? Because while this celebration was about Thanksgiving, it was really about a novel opportunity to further build community. At one point during the event, an impromptu dance party broke out. I’m still not sure how that happened but kids loved it, and it reminded me once again of how secure students must be in themselves and their peers to get on stage in front of 200 plus people and dance around. You can’t build community unless you come together as a community. Like gratitude, community is a noun but it’s not just something you have, it’s something you do and cultivate. You practice, reap the benefits, and practice some more. Of course, this wonderful moment would not have been possible without the all the parents and teachers who donated food, drinks, and coolers. MAHALO! It was delicious and lovely, and we are so happy to have you as part of our community. Tags: Assets School, Community, Student Senate, Thanksgiving, Wendell Berry | Permalink.